A Commemoration Where the "World Turned Upside Down"
It was a blustery but clear October morning as I stood outside waiting for Sherry Edwards to arrive for our drive to Yorktown, Virginia and the annual celebration of Cornwallis’ surrender to Washington. This was the 237th anniversary and Yorktown Days is somewhat like the Fourth of July, Memorial Day and Veterans Day all rolled into one. The Comte de Grasse Chapter of the DAR is primarily responsible for preserving the memory and spirit of this battle and insuring that future generations have a site to recognize and celebrate. I have asked Jennifer Carver, Chapter Regent to tell you more about her chapter’s efforts. Some of us may have difficulty when asked to give the location of where “the shot heard round the world” was fired in 1775. With the popularity of the Broadway play, “Hamilton”, however, the tune, “Yorktown (The World Turned Upside Down)” brings quickly to mind that Yorktown, Virginia and October 19, 1781 is a very important anniversary in American History. 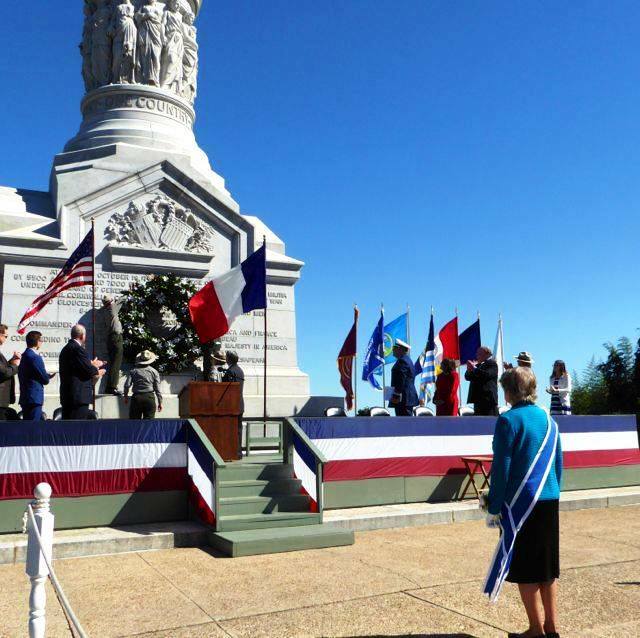 Yorktown Day, October 19, 2018, marked the commemoration of the 237th anniversary of the American-French victory in 1781 over the British. In 1781, following a nine-day bombardment, British forces in Yorktown under General Charles Cornwallis requested a cease-fire and then surrendered more than 8,000 soldiers and sailors to the combined American and French armies commanded by General George Washington. This was the last major military action of the American Revolution, effectively securing independence for the American colonies following a six-and-a-half-year military struggle. The modern-day observance of Yorktown Day dates back to 1922, when the Comte de Grasse Chapter of the Daughters of the American Revolution began an annual wreath-laying ceremony, which set the tradition upon which the current Yorktown Day is based. On October 19, Yorktown Day commemorative events are co-sponsored by the Yorktown Day Association, comprised of 13 civic, patriotic and governmental organizations, and the National Park Service, Colonial National Historical Park. For DAR members, this year’s observance was made even more special with the attendance of our President General, Ann Turner Dillon. On October 18, Mrs. Dillon arrived at the Custom House and was greeted by the Comte de Grasse Registrar Susie Dewing and myself. The Custom House was built in 1720 and has been owned and maintained by the Comte de Grasse Chapter since 1924. 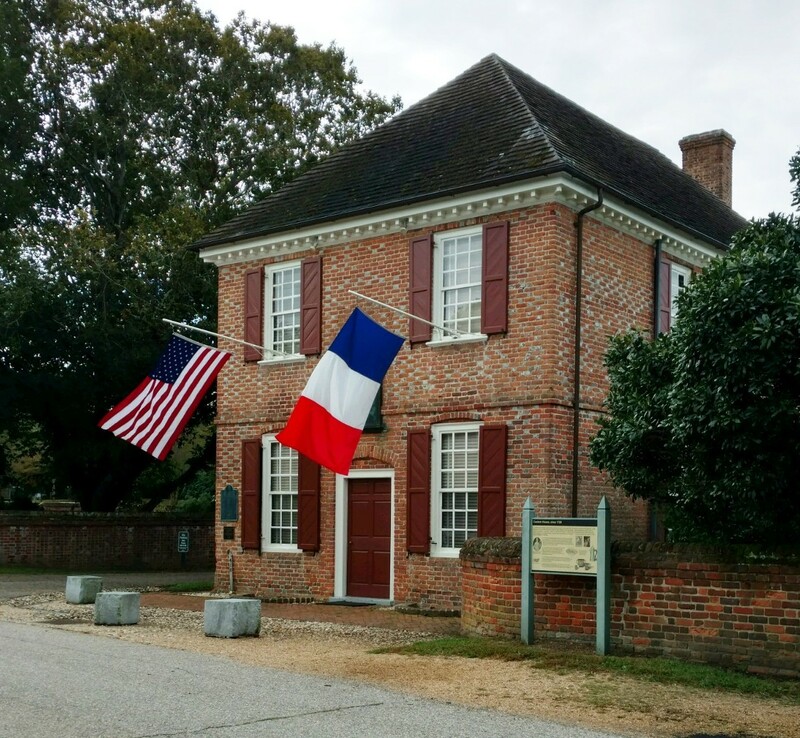 Open to the public, visitors can tour the lower floor that houses a small museum with a display of artifacts from the Nelson family, Admiral Comte de Grasse, Generals Washington, Lafayette, and Rochambeau. Mrs. Dillon took a special tour that highlighted the chapter’s role in historical preservation of the Custom House. 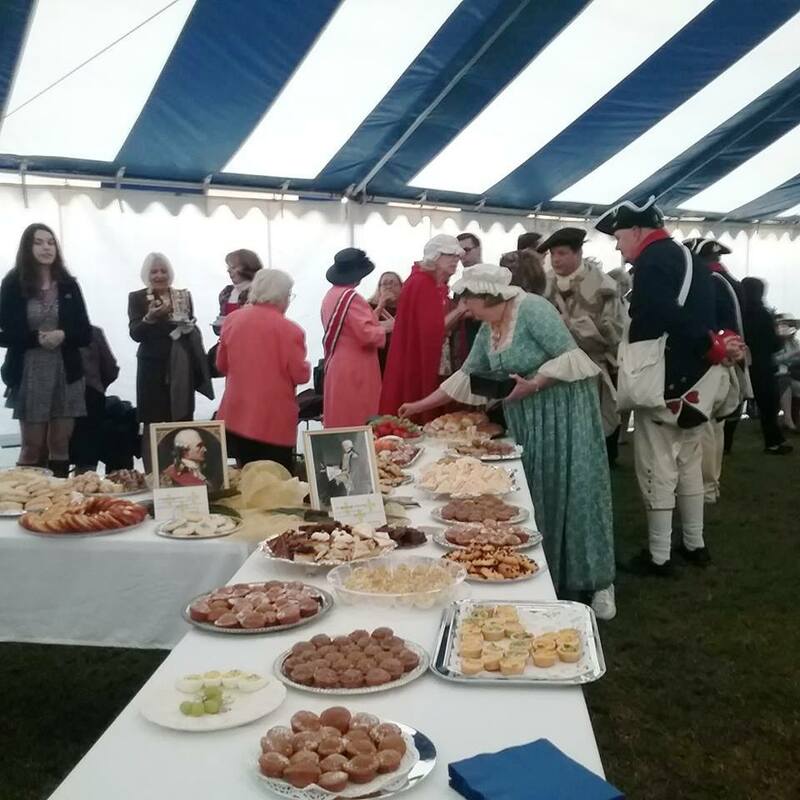 She then visited the newly opened American Revolution Museum at Yorktown and also dined with other representatives of patriotic and historic societies at the annual military appreciation dinner hosted by the Yorktown Day Association. 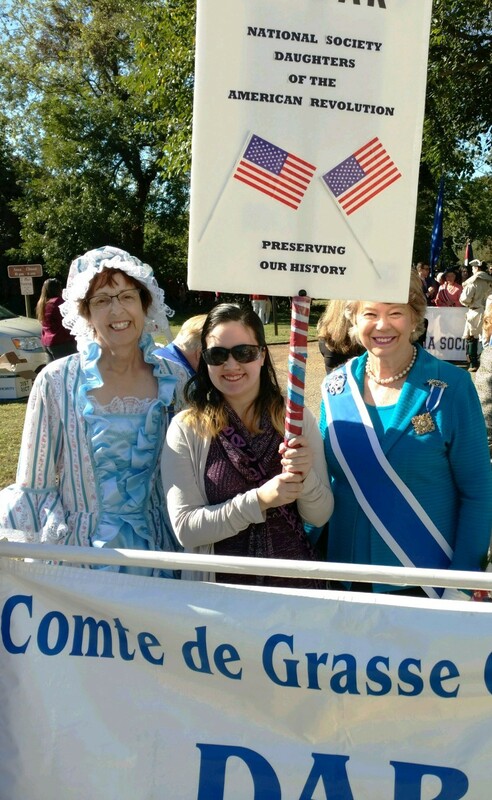 Mrs. Dillon began Yorktown Day 2018 in the Custom House Garden as the guest of honor at the Comte de Grasse Chapter Coffee which has become a signature event for the gathering of many DAR members as well as those of the Sons of the American Revolution, Children of the American Revolution, American Friends of Lafayette and other groups who recognize the contributions and sacrifices of American Revolution patriots. Early morning activities also included commemorative ceremonies at the French Cemetery and at the French Memorial. 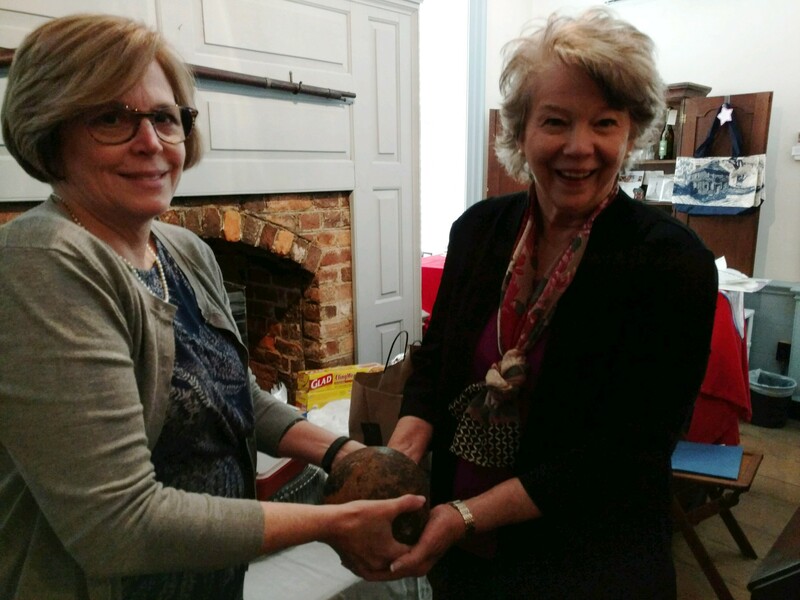 At Grace Episcopal Church, Yorktown, Mrs. Dillon joined in laying a wreath at the gravesite of Governor Thomas Nelson, Jr., signer of the Declaration of Independence. Nelson himself was engaged in the final Siege of Yorktown. According to legend, he urged General Washington to fire on his own home, the Nelson House, where Cornwallis had his headquarters, offering five guineas to the first man to hit his house. Opening the Patriotic Exercises was the annual Parade of Flags that includes the 3rd Infantry Color Guard and flags of the 13 Yorktown Day Association members. At the conclusion of the ceremony, a wreath was placed on the monument in memory of those who fought and died during the Siege of Yorktown in 1781. In keeping with Yorktown Day tradition, the Honorary Wreath Bearer is an NSDAR Executive Officer. Mrs. Dillon presented the large magnolia wreath laden with lilies. Following the Patriotic Exercises, various civic and historic groups hosted luncheons and receptions for Yorktown Day visitors and performing on the Yorktown Battlefield was The Old Guard Fifes and Drums Corps. The Shining Mountain DAR Chapter in Billings, MT, contributed to the Service to America volunteer se... 4 days 9 hours ago.